A metro will eventually be available but not yet! First take the bus, taxi or a even a 20 minute, healthy walk from the city. At the south end of the old river bed park Río Turía you will find this huge, futuristic and fantastic city of 'intelligent entertainment' which is Valencia's incredible Millenium Project . This is a whole new look to culture, science and nature. Architecturally stunning and beautifully designed, The City of Arts and Sciences (CAC) takes up a total of 350.000 metre2 and green space of 7,000 metre2. 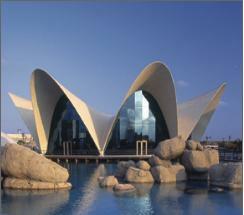 Four main buildings and a sculpture park make up CAC and then there is the Oceanografic. The Architecture, as we have already said, is stunning and is the work of Santiago Calatrava and of the late (and often forgotten) Felix Candela, who designed the L'Oceangrafic. There are 5 main areas to the complex in CAC alone and all sit surrounded by shallow mosaiced blue pools of rippling water, making it a cool area to be in, especially in summer. I must point out that all the mosaic done in and around the whole complex, and on and in the buildings, was all hand done by mosaicists, none of those cheat sheets here! Beautiful sculpture gardens surround the complex and a there is little train which takes you around the grounds. This extraordinary building, some liken it to an egg, some a ship, others a space station, designed especially for opera, seats 1800 people in a multi-functional auditorium and has a further 4 performing arts halls . It is the second largest opera house in the world and the technology is second to none, with state of the art scenery moving and electronic elevated platforms. Tickets for the operas are quite hard to come by, watch the press and buy immediately they become available! Check here for up-to-date programme or go on www.lesarts.com and be aware that even in this brand new auditorium there are no-vision areas, yes, seats behind pillars! There is an ever-changing show timetable, check press for updated programme. As you walk around the grounds, watch the building to see the 'eyelids' open, fascinating! This enormous white skeleton-like building is home to the science museum and could certainly take several hours, if not a good day, to get around, particularly if you have children with you. It has a great 'hands on' section with all the gadgetery to teach children(and adults of course! ), about electricity, light, sound, how the body works and a fun Sports section where one can test one's abilities, speed, balance and strength. A good restaurant, cafe and gift shop can be found on the ground floor without purchasing a ticket for the whole museum. If you are visiting in July there is the annual Eclèctic Festival, great music and entertainment events in the grounds and even better, free admission! which is cleverly staged on the wonderful bed of water. Another white rib-like structure, 60 metres high, beautifully lined with palm trees, is one of the main entrances to the city of arts and sciences. It is situated on top of the main car park giving a fabulous view across the whole complex. Inside the L´Úmbracle there are lovely aromatic gardens, unusual plants from around the world, and some interesting sculptures. As I write this one end has been converted into a fantastic chill bar, but it's unlikely this will stay beyond September. At either end there are pretty white cone like constructions which surprisingly house the lifts. To the edge of the car park at street level there are huge blue mosaiced air ducts for the car park, I can only see them as giant's urinals! Tickets for this can be bought individually or as mentioned before as a combined entrance pass with all the sights. To really take in everything here you should allow a good day. The oceanarium here is said to be the largest in Europe and the second biggest in the world. Many people feel this oceanarium is easily on a par with any American park and many feel it better, especially the dolphin show, where 20 bottlenose dolphins entertain you, which is superb. Be sure to pick up the show timetable on entering the park and get a good seat early. There are 45,000 kinds of fish and marine mammals from 500 species. Underground the park covers oceans of the world, Mediterranean, Arctic , Antarctic, Tropical and warm seas. As you walk through the various continents, there are enormous subterranean aquariums containing beautiful species, our particular favourite is the extremely long tank that you walk through feeling you are truly part of the water and be sure to look up and look eye to eye with those fishes! Within the park there are several, cafes and restaurants.A very special place to eat is the Submarine Restaurant where you sit surrounded by fish, in a huge aquarium, be sure to book as it gets very busy, it is also open in the evening after the park is closed.